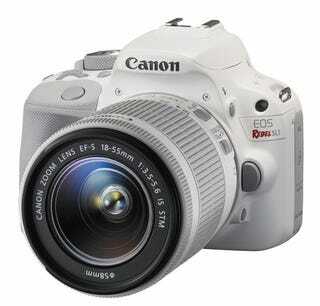 The new white Canon EOS Rebel SL1 is identical to its launch state, except for its color. Weighing 14.36 ounces, it has an 18-megapixel CMOS APS-C sensor with the Digic 5 image processor, giving it an ISO range of 100-12,800, expandable to ISO 25,600. It has a shooting speed of up to four frames per second, Canon's nine-point center cross-type autofocus using its Hybrid CMOS AF II sensor, and a 3-inch touch screen LCD. The white version is shipping with a similar-colored of the EF-S 18-55mm f/3.5-5.6 IS STM lens for $750 at the end of June.